The body has different mechanisms to keep infectious agents at bay. In the case of the respiratory tract, sneezing and coughing are some of those mechanisms that allow to clear the respiratory tract. When there is phlegm in the lungs product of some infection or allergic reaction, the cough is the form with which the organism reacts to mobilize and to expel this phlegm, that of another form becomes breeding ground so that the pathogenic agents multiply. Phlegm indicates that the body is reacting to some infection and cough is the way to expel it. If you are interested in the topic, continue reading the following article in which we tell you what cough is with white phlegm: causes and treatment. The cough is the way in which our body responds to an irritation of the respiratory or throat, i.e., it is the natural reaction of the body to release the airways of any agent that hinders. The phlegm on the other hand normally occurs in a certain amount, when it becomes very abundant and viscous it is the respiratory system reacting to a virus or bacteria that has managed to penetrate it. When the cough is accompanied by expulsion of phlegm or expectoration, it is said that it is productive. If the cough is productive it means that an infectious process is in full development. The cough helps to mobilize and expel phlegm, so that this does not become the culture medium of the infectious agent. That is why at this stage antitussives that prevent cough are not recommended, and rather it is good that the individual coughs to help evacuate that mucus out of the body. Usually, when the infection is starting the phlegm is white but if the infection progresses the phlegm changes color and may turn yellow, green, brown or contain blood. The color of the phlegm is an indicator of the evolution of the infection. In most cases, when the mucus is white it is usually a viral infection. At that time the nose is less resistant to bacterial penetration, so it is very common that after a cold a bacterial infection occurs in the nose and sinuses, which becomes evident when the mucus goes from white to yellow or green. Burning, itching or sore throat. Difficulty and discomfort when swallowing. Pressure or pain in the chest when breathing. Increased body temperature and chills. Under normal conditions, the respiratory system produces a certain amount of mucus, whose function is lubrication and protection, because when an external agent enters it is trapped in the mucus and thus is expelled. When the amount of phlegm is greater, it means that the organism is reacting to an infectious agent. 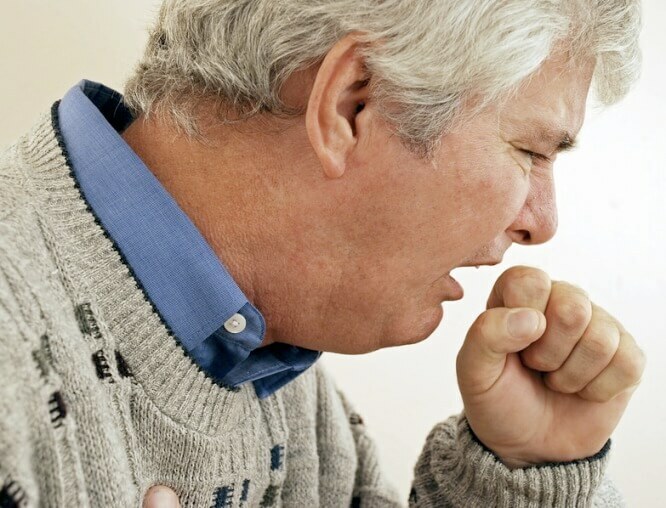 Infection or lung diseases: acute bronchitis, pneumonia and others. Inflammation of the larynx or pharynx. Infections in the paranasal sinuses. Allergies: seasonal, environmental or certain foods. When the cough is accompanied by white phlegm it can be treated with some home remedies, including a lot of rest. However, when the phlegm is green, brown or contains traces of blood it is urgent to go to the doctor, because it can be serious diseases, even heart problems. If there is a cough with white phlegm, the first thing to take into account is that the cough is a mechanism that allows to mobilize and expectorate the phlegm, so it is advisable not to cut the cough. Rather, to help make expectoration easier it is important that the phlegm becomes more fluid. For this, it is essential to keep well hydrated by drinking plenty of fluids, either directly water, juices, infusions or soups. Other recommendations, such as not smoking and keeping the environment with sufficient humidity, should also be taken into account. As for natural juices, it is advisable to consume them from fruits that are rich in vitamin C, to help the immune system to fight against the infection. Another strategy that works to help eliminate phlegm are vapor inhalations, which can be only water or salt water, eucalyptus or menthol. When the phlegm is no longer white, the doctor must evaluate the patient and prescribe mucolytics or some medication that helps to expel phlegm. As the infection progresses, the picture gets complicated and surely the patient will need more medications, even antibiotics may be needed. Salt water gargle: Two glasses of water are boiled with two tablespoons of salt. Once the water is warm, the first gargles are made. With this solution the operation is repeated two to three times during the day for several days or until it heals. Gargling water with myrrh: Mix half a teaspoon of myrrh with two cups of warm water and gargle three to four times a day. Myrrh is antimicrobial and expectorant at the same time. Pineapple juice with ginger: The pineapple has anti-inflammatory properties and in turn the ginger helps to cure the ailments of the throat. Carrot and ginger juice: Carrot and ginger combined help fight the infection. Garlic cloves: You can be chewed garlic cloves on an empty stomach or with a tablespoon of honey or do infusion. Garlic is a natural antibiotic and is used to treat infections in general, not just those of the respiratory tract. Infusion of onion, lemon, honey and ginger: It is a potent mixture, the onion exerts an antispasmodic, sedative, antibiotic, mucolytic, bronchodilator and expectorant action. It is recommended not only in infusion but also in salad and even it is recommended to cut a piece and place it next to the bed for breathing vapors. Lemon tea: Relieves throat itching and is easily prepared with boiling water, a little black tea, lemon juice and honey. Licorice and mint tea: The mixture of licorice and mint help eliminate phlegm. Steam inhalations or hot water bath: iIt serves to open the airways and is very easy to do, just place a pot with boiling water, put a towel over your head and breathe the steam. A hot water bath fulfills the same function. Inhalations with thyme or eucalyptus: This is the same procedure explained above, only in this case to make it more effective you can add some drops of eucalyptus oil or some sprigs of thyme at the time of boiling the water. Similarly, the ancient recipe for a hot chicken soup will also help to expectorate the phlegm, it serves the same function of hydrating the individual and if you add enough onion, garlic and some spicy, it will have everything in one.